Mother’s Day only comes once a year. Let her know how special she is by treating her to brunch. SpiritLine Cruises will be honoring all Moms on Sunday, May 12th. 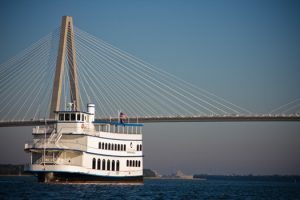 Join us for a delicious brunch, while we cruise the beautiful Charleston Harbor from 11:30am until 1:30pm. Live smooth jazz and a complimentary mimosa will be provided for all adult guests. No cancellations accepted after 5:00pm on Friday, May 10th, 2019. *Please note this cruise is rain or shine. Please refrain from bringing strollers on board for safety reasons.